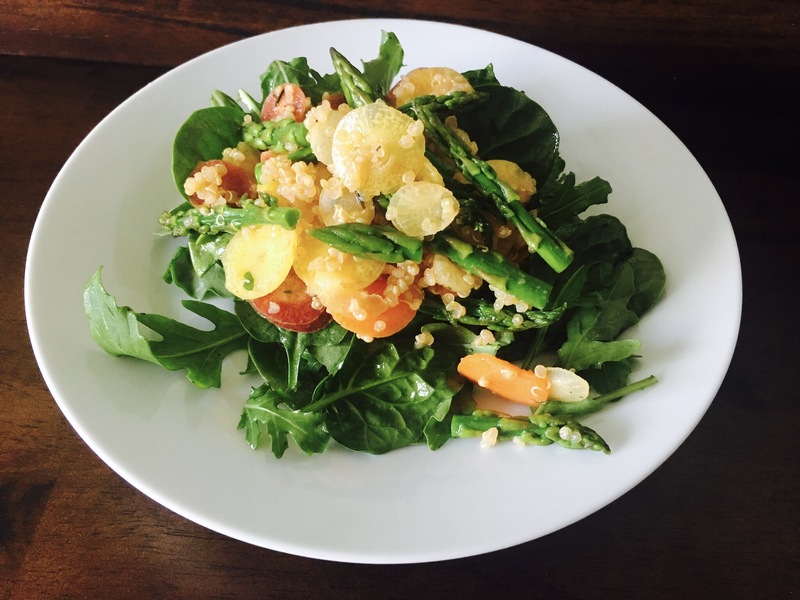 Arugula, quinoa, rainbow carrot, asparagus salad with homemade garlic lemon dressing. – Hurried Home Chef! Arugula, quinoa, rainbow carrot, asparagus salad with homemade garlic lemon dressing. 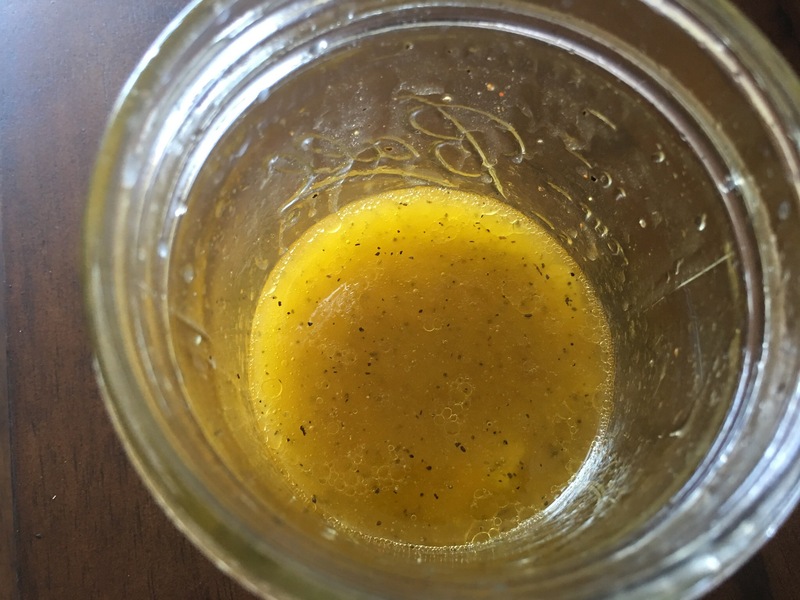 Salad dressing is a rip off, make your own! Here I used lemon juice, EVOO, and spices. 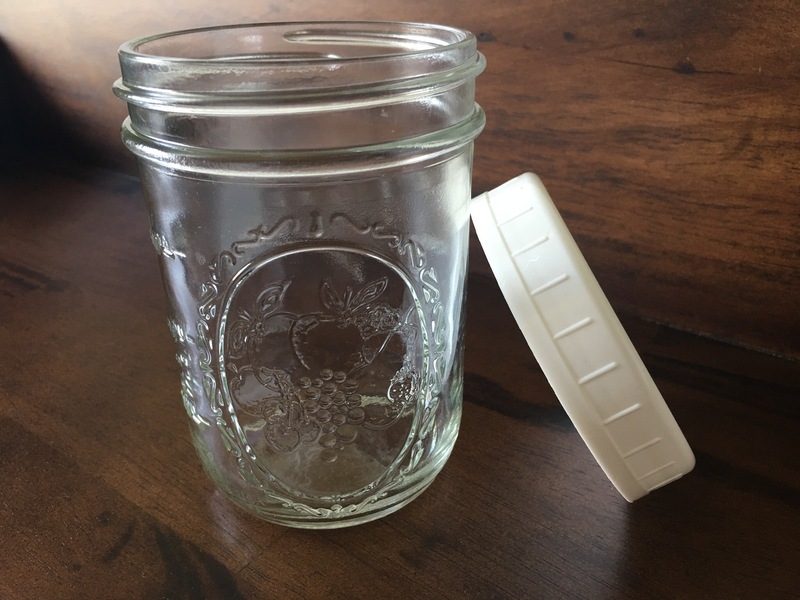 Get a mason jar and plastic lid if those metal ones drive you crazy. Here I have a few cloves of garlic, peeled and smashed. I also found Meyer lemons (a more mellow flavor) that I zested and squeezed. I used 2 lemons to about 1/4 cup EVOO. 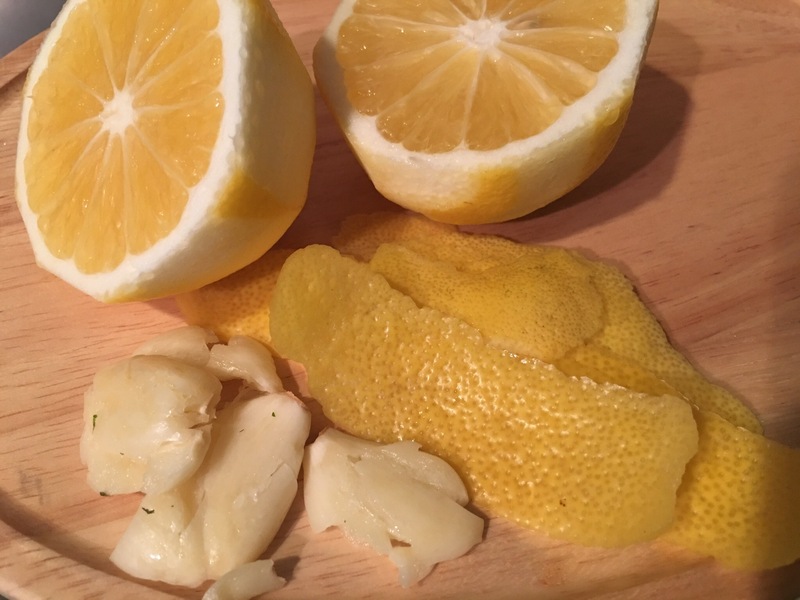 If you have a big crew, try 4 lemons with the zest of 2, and equal part EVOO unless you are ok with the bite of lemon then use less oil. You can smash about 6 cloves of garlic for the large batch. The spicy pepper is key here, I love a ground habanero or chili pepper. Then I added salt, pepper, ground habanero pepper, parsley, then shake and refrigerate. 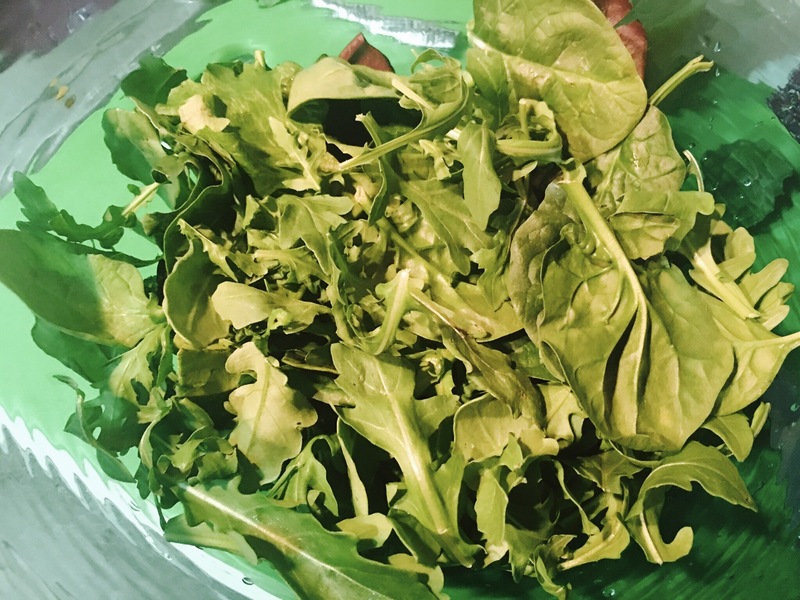 I used 75% arugula and about 25% spinach, but I love that peppery taste, you may want to make that 50/50. I dressed this then plated it and added the veggies on top. I have a tiny mandolin that I used to make these perfect carrot rounds. 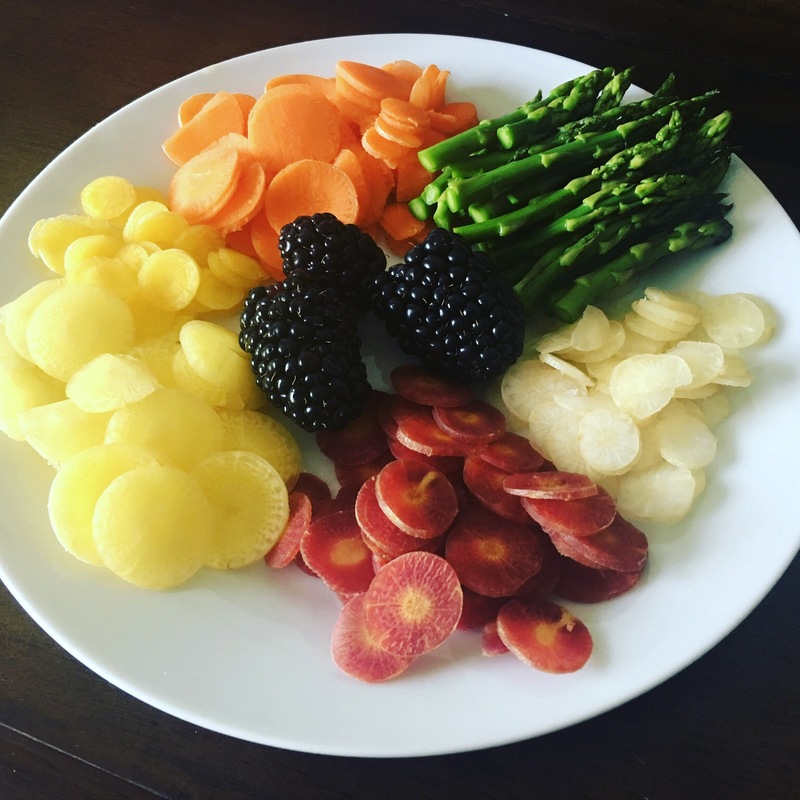 I blanched the asparagus but left the rest raw. I made some quinoa and tossed some veggies with the dressing then topped the greens with it. Good for your gluten-free, vegan friends and you! Next Post Spiralized beets with spicy chicken thighs, quinoa and brussel sprouts.